NVIDIA supplied us with beta driver version 368.19 for testing, and that’s what we used for both benchmarking and overclocking. For our comparison cards, we included NVIDIA’s top performers from the last generation, and a couple of AMD’s Fiji cards, the Radeon R9 Fury and Nano. We’ve updated our performance benchmarks to include a handful of the latest titles. Two benchmark games, Hitman and Ashes of the Singularity, also take advantage of DirectX 12, so we were also able to get a look at how the GeForce GTX 1070 performed using Microsoft’s latest gaming API. 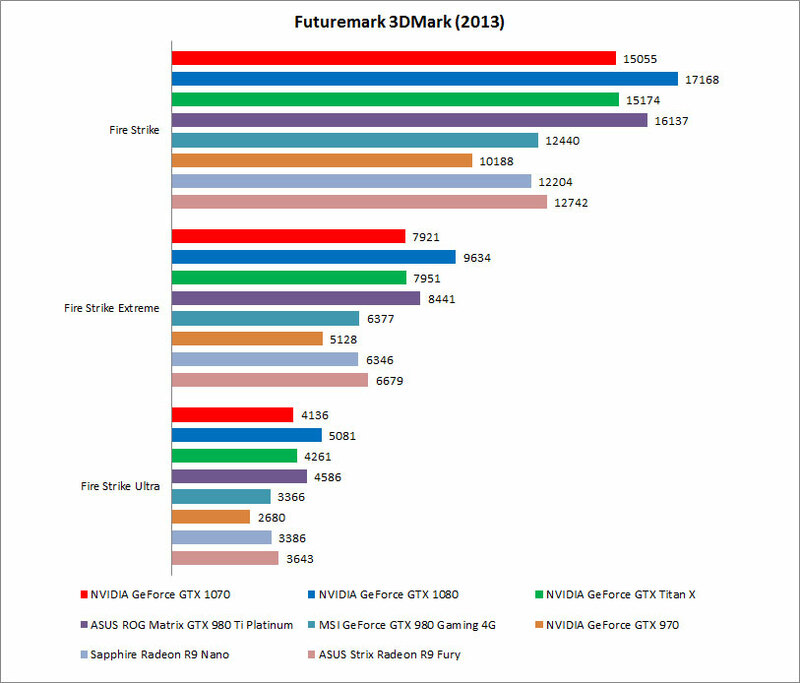 We used the Fire Strike Extreme test in 3DMark (2013) for our power and temperature tests. In 3DMark, the NVIDIA GeForce GTX displayed figures in line with what the GeForce GTX Titan X served up. There were minuscule – bordering on insignificant – differences across the board, so there’s really little point in calculating percentage differences. However, compared to the GeForce GTX 1080, the latter was around 15 to 20 percent faster than the 1070, depending on the tested resolution. The GeForce GTX 1070 was also over 50 percent faster than the GeForce GTX 970 in Fire Strike Extreme and Ultra, which bodes well for gamers looking for an upgrade to a relatively affordable card that is better able to handle high resolution gaming. 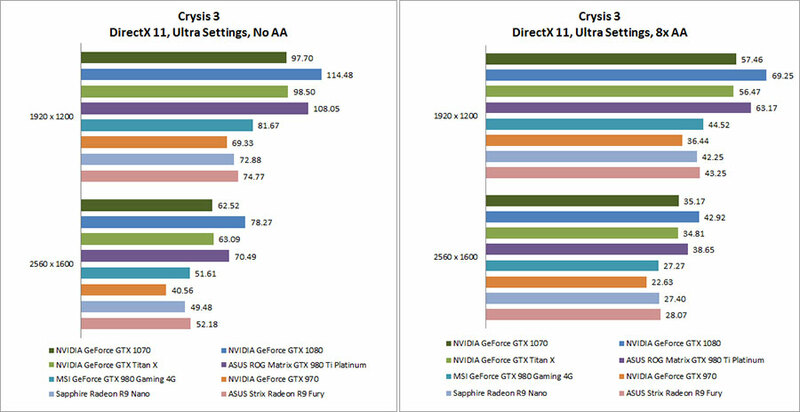 The card also handily beat out the two AMD Fiji-based cards. At US$499, the Nano even costs more than the GeForce GTX 1070. Time and time again, things continue to work out in NVIDIA’s favor, as the green camp consistently shows that it can beat AMD at nearly every performance segment and price point (at least until AMD's next-gen comes out). But now for the actual gaming benchmarks. 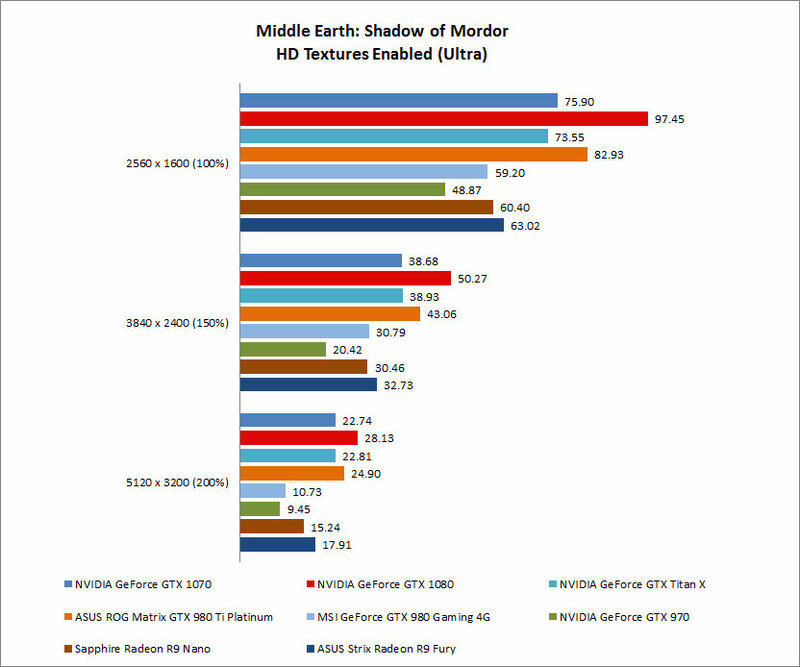 In Middle-earth: Shadow of Mordor, the GeForce GTX 1070 continued to serve up numbers that were almost uncannily close to that of the GeForce GTX Titan X. Truly, NVIDIA just made a Titan X at less than half the price. We also weren’t too surprised to see that the GeForce GTX 1080 was still quite far ahead of the pack, coming in at around 28 percent faster than the 1070. With that said, the flagship Pascal card, and the factory overclocked GeForce GTX 980 Ti, were about all that managed to beat the GeForce GTX 1070. It cruised to a commanding lead over all the other cards, the GeForce GTX Titan X excepted. There was a similar pattern in Crysis 3. The GeForce GTX 1070 and Titan X were once again neck-and-neck with each other, while the 1080 maintained its lead at the head of the group. We’ll focus on the higher resolution settings here as the Pascal cards are intended for more demanding scenarios like these, and would really be wasted on regular 1080p gaming. At Ultra settings with a resolution of 1600p, the GeForce GTX 1070 was a whopping 55 percent faster than the GeForce GTX 970. In turn, the GeForce GTX 1080 was about 22 percent faster than the 1070. That may not seem like an especially staggering lead, but it is still very significant, especially at higher resolutions with all the eye candy turned up. Even the most powerful cards continue to be taxed with settings like these, and a 20 percent lead can often make the difference between a choppy and playable gaming experience. 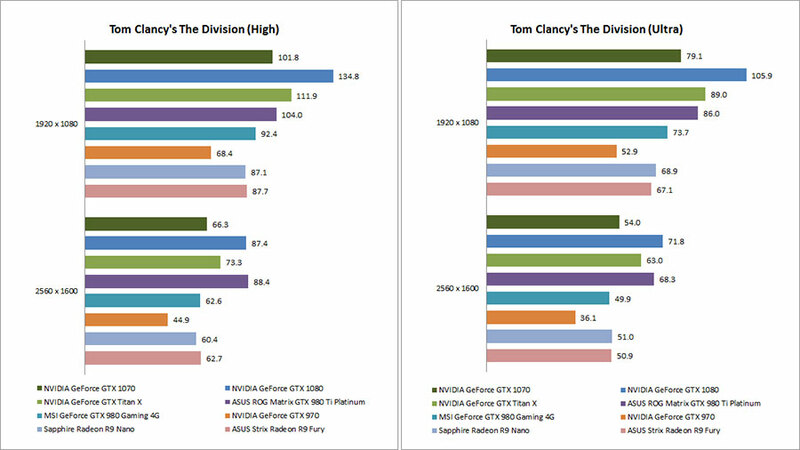 The GeForce GTX 1070 fared less well in The Division, falling behind the GeForce GTX Titan X more than it did in the other benchmarks. That aside, it was still ahead of the majority of the other 'high-end' tier cards. However, the GeForce GTX 1080 really showed that it isn’t just the single-GPU king in name only. At a resolution of 1600p and Ultra settings, it was around 33 percent faster than the 1070. As it turns out, while NVIDIA may be pitching both cards in a similar vein as each other, that is, for VR and other demanding use cases, it’s clear that you’ll still want to get the GeForce GTX 1080 if you game at quad HD resolutions and like to crank all the settings up.